Documentation » Questions and Answers » How do I share/release/change edition ownership? How do I share/release/change edition ownership? The LibX Edition Builder keeps track of who maintains which LibX edition. Each edition may be maintained by one or more maintainers. Maintainers are identified by their email address that they used to sign up for the LibX edition builder. All maintainers have equal access to a LibX edition. Initially, a LibX edition is owned by whoever created it. That maintainer has the option of sharing this ownership with other maintainers and/or releasing ownership of that edition. Releasing ownership of an edition does not delete the edition; it simply means that its previous maintainer will be unable to access it to create new revisions. The management of LibX edition ownership is designed to not requirement involvement of the LibX maintainers for common tasks such as a change in the maintainer of an edition. A common scenario is for a librarian who leaves a library or switches positions to pass ownership to a new maintainer. This involves three steps. a) The new maintainer must register with the LibX edition builder. 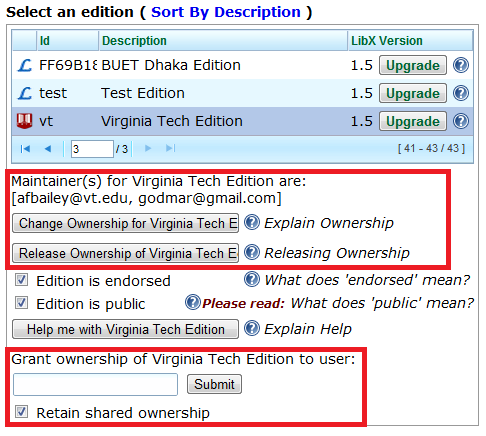 b) The old maintainer must log on, select the edition, and share ownership with the new maintainer. c) The old maintainer can then release ownership. By unchecking the box ‘Retain shared ownership’, steps b) and c) can be combined. Below is a screenshot. Please note that the box: “Grant ownership of …” appears only after you select the edition whose ownership you want to change and then press the “Change Ownership…” button. Some libraries use an email alias, such as libxmaintainer@institution.edu in order to not have to change ownership in this way. Please make sure you use a valid email address so that password reminders can be sent to you. Changing the edition maintainer if the original maintainer is unreachable or their email address has been deactivated. In this case, the LibX maintainers need to be involved; send us email.